Leche flan is a favourite and popular dessert in the Philippines. It is similar to a cream caramel. Sweet and rich flavor that is a perfect way to end a satisfying meal. This is very popular during special occasion or gatherings especially Christmas and birthdays. Leche flan comes from a huge family of caramel custards, crème caramels, or flans that is actually a group of desserts made of egg, milk, and sweeteners and that is eaten in many forms across the world. The most famous member of this family, of course, is crème brûlée, which, unlike leche flan, has a hard caramel topping. 1. In a saucepan, mix the sugar and water. Boil until sugar is melted and caramelized. 2. Pour the caramelized sugar into aluminum moulds which can be of any shape like round, oval, or square. Spread the caramel into the moulds. 3. Mix well the evaporated milk, condensed milk, egg yolks, and vanilla. It’s better if you mix them with a blender for smoothness. 4. Slowly pour the mixture on top of the caramel on the moulds. Fill about 1 to 1-1/4 inch thick. Cover the moulds with aluminum foil. 5. Cook by steaming for about 20 minutes or by baking it for about 45 minutes. Make sure you pre-heat oven to about 370 degrees before baking. Leche Flan is cooked when you insert a knife or toothpick - it comes out clean. 6. Let it cool and refrigerate. 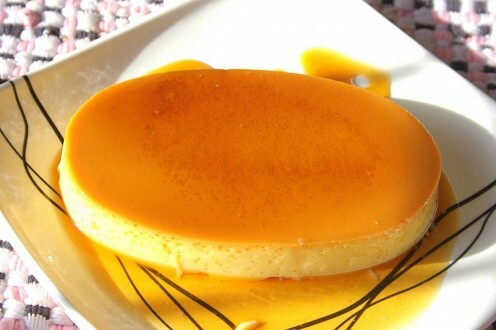 Loosen the Leche Flan by running a thin knife around the edges of the mould. Cover with a platter then quickly turn upside down to show the golden brown caramel on top.